PALMDALE – Two suspects were arrested early Friday morning after they allegedly kidnapped a female from a park in Palmdale and then led officers on a chase that ended on the 405 Freeway in Irvine, authorities said. The incident began Thursday night. Palmdale Sheriff’s Station deputies were flagged down in the 38000 block of 10th Street East by an informant who said that his girlfriend had been kidnapped, according to a news release from the Palmdale Sheriff’s Station. The informant told deputies that he was supposed to meet his girlfriend near Courson Park, but when he arrived, his girlfriend was in the backseat of a vehicle, apparently being held against her will, according to the news release. “Both suspects were seated in the front driver and passenger side seats. When the informant asked for his girlfriend to exit the vehicle, the suspects made statements indicating she would not be exiting their vehicle. The suspects locked the doors and drove away with the informant pursuing them. The informant eventually lost sight of the vehicle,” the news release states. As he was speaking with deputies, the informant received text messages from his girlfriend stating she was scared and being held against her will. The Sheriff Department’s Aero Unit was requested, and the suspect vehicle was spotted around 11:30 p.m. on the 14 freeway in Santa Clarita. The Aero Units directed California Highway Patrol officers toward the vehicle, and when the vehicle failed to yield, a pursuit was initiated, according to the news release. 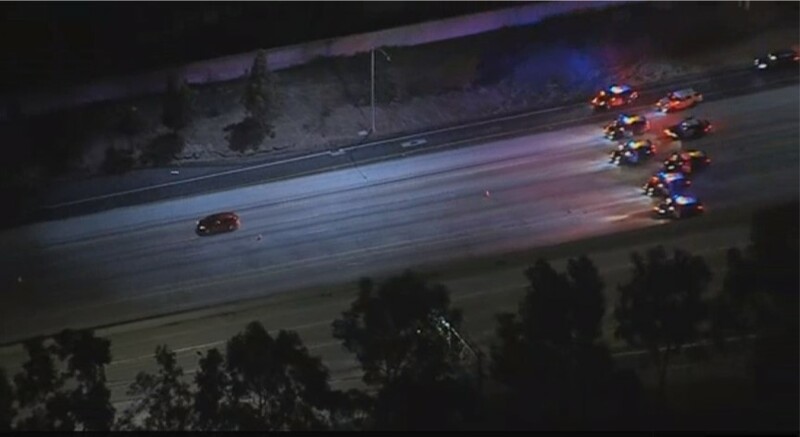 “The suspects were pursued by CHP into the city of Irvine where the suspect vehicle ran out of gas and stopped on the 405 freeway near the Culver Street exit. At 12:45 a.m. [Friday, March 22], the suspects were taken into custody without incident,” the sheriff’s news release states. The victim was found unharmed inside the vehicle. “The suspects were arrested for kidnapping and the driver was additionally charged with reckless evading. Both suspects were transported to Palmdale Station and booked for the indicated charges,” the news release states. 3 comments for "2 arrested after kidnapping in Palmdale, police chase"
A sixteen year old girl kidnapped by a 24 year old, and a 17 year old. One of the males is a paraplegic. She is too young to be out meeting a boyfriend at a park late at night anyway. Happy that she is safe.